Back row, from left: Dylan Mirabal, Taylor Willis, Christian Skinner, Rachel Fox, Joshua Crisler. Front row: Justin Grant, Emily Hopkins. Christian Skinner earned pitching victories against Paloma Valley Feb. 28 and Mission Vista March 7. He entered this week with a 1.40 ERA. He was also hitting .545 with 7 RBIs for the Rams baseball team. Rachel Fox set a team record in the 200 individual medley for the girls swim team. Justin Grant swam a personal best of 1:01 in the 100 backstroke for the boys team. Freshman midfielder Joshua Crisler of the boys lacrosse team scored 7 goals with 2 assists through the first three games. Junior Emily Hopkins scored 7 goals in a game against rival Murrieta Valley for the girls lacrosse team. "She uses her athletic ability and dedication to this new sport to grow every day as an athlete," said her coach, Molly Sovacool, about the team captain. Shawn Williams of the boys track team set a school record in the 400-meter run last week and has been a big part of the team's success. He runs the 4x100 relay, 4x400 relay, and the open 400 and 200 meters. Dylan Mirabal was honored for his contributions for the boys golf team. Senior outfielder Taylor Willis is one of the top players for the Rams' softball team. 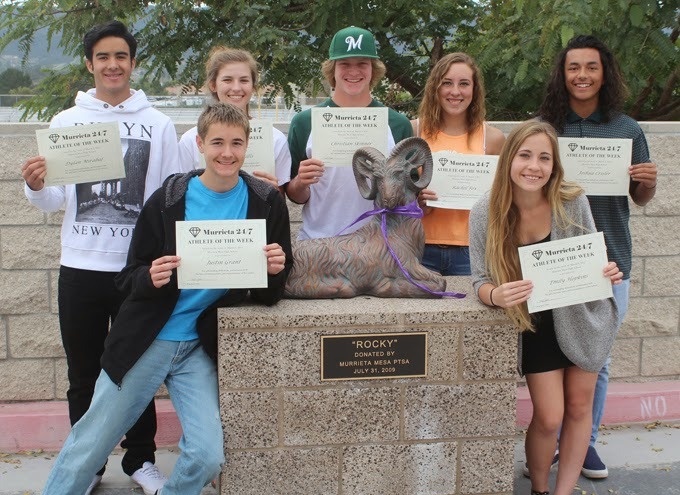 These athletes will be eligible for selection as Murrieta Mesa High School's Athletes of the Month, which will be announced the first week in April. Anyone wishing to order a glossy print of this article with photo may do so by emailing murrieta247info@gmail.com.